The greatest marathon in the world more than lived up to its billing. The men's race started at a near-suicidal 14:21 for the 1st 5k. Ryan Hall went with the 62:13 1st half. Ultimately it came down to a three man battle over the final mile between Goumri, Lel and Wanjiru. At the 26 mile mark, it was down to Lel and Wanjiru and Lel showed once again that no one can outsprint him in a marathon. He casually glanced at his watch and then took off, running to a course record 2:05.16 win. Unreal. 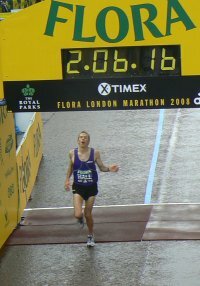 Ryan Hall powered home in 5th in a stellar 2:06:17. In the women's race, favorite Gete Wami went down at a water stop, got back up and rejoined the leaders but ultimately Irina Mikitenko pulled away for the win. LRCMid-Race Updates!!! Men are ROLLING!!! 14:21 1st 5k. 2:01 pace. On 2:03 pace at 8 miles which was hit in 37:36. Ryan Hall in lead group. 9 miles 42:28 so last mile . 44:00 for 15k. 4:43 11th mile. 1:02:13 at half. Rabbits stop, then Ramaala is dropped, Limo and 1:20:30 into the race Ryan Hall is dropped. 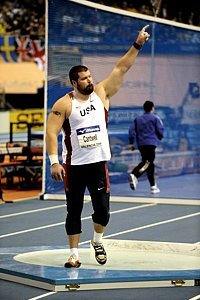 At 25,k, Hall smashed the US record. At 30k, the leader Lel smashed the African record. Hall is only 8 seconds back. 1:58:53 at 40k and it's Lel, Goumri and Wanjiru battling it out. Hall nearly catches up at 22 miles. Lel just crushes Waniru after they hit the 26 mile mark. Lel 2:05.16. Lel = Greatest Marathoner Ever? 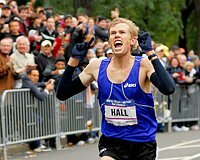 Hall runs 2:06:16 = Greatest American born marathoner ever!!!!. Women's: Gete Wami Falls At Water Stop - 1:42 in. She catchsd Back Up. 6 Women Still Together at 1:53! Mikitenko wins. LetsRun.com : Better Late Than Never - Our Race Predictions While we think trying to predict what will happen in a marathon is absurd, we give you our predictions as we said we would. If we knew what was going to happen, we wouldn't be getting up at 4:00 am to watch this much anticipated race. Rotterdam: William Kipsang Sets New CR of 2:05:50.